New shopping network: Win a €1,000 Shopping Spree! Posted by The MyHome Newsdesk	in General	with No Comments on New shopping network: Win a €1,000 Shopping Spree! To celebrate the launch of MyHome.ie’s new shopping network Littlewoods Ireland, Ireland’s Leading Online Department Store is giving you the chance to win a whopping €1,000 shopping spree to spend on anything you choose from the huge range available on LittlewoodsIreland.ie! With MyHome’s new shopping network and with the help of Littlewoods Ireland you can now browse over 20,000 products online where you’ll find something for you and your family from fashion and footwear to interiors and electrical goods. 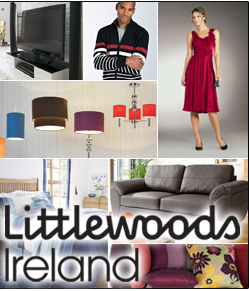 To be in with a chance to win this fabulous prize all you have to do is answer this simple question: How many days does it take for your Littlewoods Ireland purchases to be delivered to you? If you”re not too sure you can find a hint… here!